Pastyman™ can offer complete catering solutions for any event. Simplicity is the key. We can deliver frozen un-cooked pasties to be cooked onsite (60 mins cooking time), or pre-cooked pasties which are ready to defrost and reheat (25 mins reheating). The beauty is that preparation, cleaning-up time and effort and more importantly overall costs, are kept to a minimum. Parties where you want a light snack. Parties where you want something to eat, but without the hassle! Our large pasties certainly hit the spot if you're hungry! A Cornishman would generally choose a large. Call us now on 0845 094 0184 to arrange your large order discounts. The various size options enable Pastyman™ to cater for any party. Children love pasties and the cocktail or even small sizes are ideal. Less hassle for Mum and Dad: all they have to do is pop them in the oven! Many weddings in Cornwall feature pasties as part of a buffet, or even as the main meal. We have even heard people complain if they come to a Cornish wedding and there are no pasties! We suggest using Medium sizes, and even some smalls if little hands are present. Whether it be indoors or out; on a race track, paintball field or onboard a yacht, our pasties certainly hit the spot. With the benefit of both Meat and Vegetarian options, you can't go far wrong. Our prices ensure that you can get a wholesome meal for a realistic price, especially if budgets are tight. 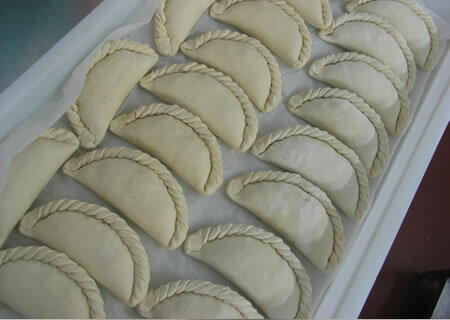 If you require an order of above 50 pasties please contact us for manufacture and delivery times. We do our utmost to stick to our standard Pasty Delivery Times (see below), but as all our pasties are hand made, we may need a little longer to get larger orders made. We offer discounts on larger orders.